LaLD Car Week - French Free for all Friday: Liberté, égalité, fraternité! LaLD Car Week has been great. I saw a lot of great stuff come by, nice photography and it has generated quite the data-traffic on my ISP’s network. The only disappointment about this year’s LaLD Car Week, to me that is, was the drop of the official best theme day of the week: French Friday! Sure: On Free for all Friday I can put another French car on display but I really was hoping to see a lot of French cars. I’ll just lead the way obviously. And to verify my entry is French alright there has to be something really weird about this car, so I present you: a car without a windshield. 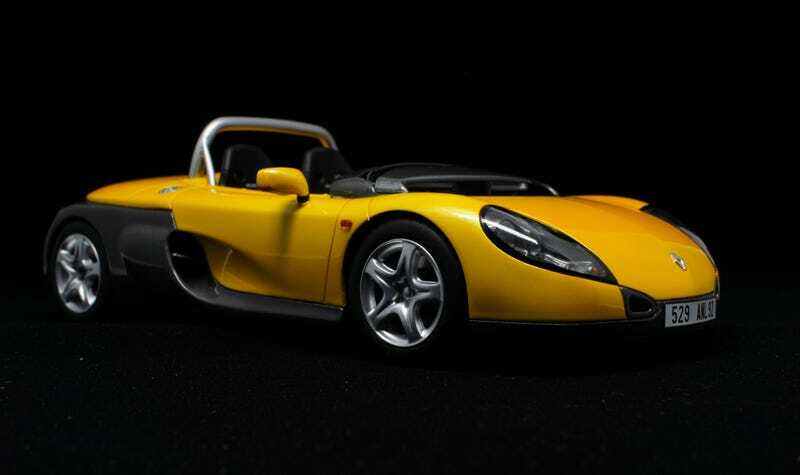 The nutty car you see here is a Renault Sport Spider (in some countries it was sold as just a Renault Spider).In the early ‘90's Renault was extremely successful in Formula One with the Williams team, winning several championships. But Renault’s Alpine A610 didn’t really market the brand as being a sporty brand due to it’s price and slow sales so Renault came up with a true lightweight sportscar. Still not cheap but certainly one of the most extreme cars available for that kind of money. To demonstrate it’s extremity: There was no windshield, it had a wind deflector. So no foldable roof was possible either. Later in it’s life the windshield became an option and looking back that was a great idea as most of the Spiders were sold with one. To me the car with the windshield always looked better but I’m not so sure anymore: the deflector ones have grown on me so to speak. But make no mistake: The deflector works but you still need extra protection from flies and other stuff torpedoed into your eyes. So it’s no surprise the windshield option was the most popular option. Not many other options were available, not many colors either, just the official Renault Sport colors: Titan Grey, Sport Blue Pearl, Sport Red Pearl or this Sport Yellow Pearl. Other options available for the car were: Airbag (only for the windscreen models), hood for windscreen models, a radio, a car cover, interior-carpet, a luggage-rack and special rims. Also 80 Spider Trophy cars with full rollcage were built for a special (European) racing series. In four years time the Renault’s Dieppe (the former Alpine factory!!!) production facility built 1640 Spiders. MR equipped with the 1998 cm3 F7R engine from the fastest Renault Megane it put out 147hp and it took the 930kg car 6,9 seconds to reach 61mph. Top speed was 215 km/h. The brakes were 300mm discs with Alpine A610 Turbo calipers. That should be sufficient as the Alpine weighed 400 kgs more! It was 37k euros over here in the Netherlands, probably somewhat cheaper in the rest of Europe. Now they can be found used for just over 30k but an excellent low mileage example will set you back more than what it cost new already. As we speak 8 are for sale in Germany alone so it’s not that hard to get one. The model itself is an 1/18 Ottomobile from my Ottohaul a few weeks ago. Not sure what Otto used to ask for this one as it’s sold out but it’s either 59 or 69 euros as that used to be the standard price of Otto’s 1/18's. I was extremely lucky to get 4 of these for about 40 euros each as I’m really impressed with their quality. As shooting 1/18's is completely new to me the shots are a bit different as I have no diorama. Nor does my lightbox have that much space left so the shots are a bit more focused on the car, hope you all appreciate it a bit. C’est ca! Pouraujourd’hui. Et pendant toute la LaLD semaine de voiture! Thank you all for this great week and see you next year! Bon Week-End!